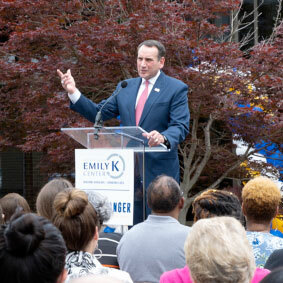 Mike Krzyzewski, head coach of Duke Men’s Basketball and Board Chair of the Durham-based Emily Krzyzewski Center, announced the public launch of a three year, $15 million fundraising campaign for the Emily K Center at a special launch event held at the Center on Wednesday, May 30. Named the Game Changer Campaign, this initiative will support Center operations, enhance educational programs, ensure the organization’s long-term sustainability, and add a 4,500 square foot addition to the facility. Mike and Mickie Krzyzewski also announced their personal commitment toward the campaign, a $3 million gift, which represents their largest, single philanthropic contribution ever. “The Emily Krzyzewski Center is incredibly important to Mickie and me. It is named after my mom, and she was the best person I knew. Amazing things happen at the Center and Mickie and I are thrilled to be able to make this commitment and this gift,” said Krzyzewski. As of May 30, the Center has raised $8 million toward the $15 million campaign goal. Efforts to raise the balance will continue over the next two years. Chairing the campaign steering committee are Durham community members Jane Dimmig and Wayne Holden. Community members wishing to learn more about the campaign or contribute may visit www.emilyk.org. The Emily Krzyzewski Center is a non-profit organization that serves as a college access hub in Durham, North Carolina, propelling academically-focused, low-income K-12 students and graduates toward success in college through its K to College programs while also offering college information and advising support to any local high school student through the Game Plan: College program. Through broader facility partnerships, thousands of additional students and community members use the Center as a place to convene, learn, and grow. Founded by Duke Men’s Basketball Coach Mike Krzyzewski, and named in honor of his mother Emily, the Center’s mission is to inspire students to dream big, act with character and purpose, and reach their potential as leaders in the community.